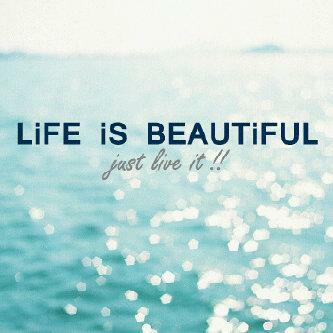 Life is beautiful…just live it !!! This life is a wonderful gift…accept it, embrace it. It starts with a new day…wake up and greet it. Life is a challenge…take it head on, and meet it. Full of opportunity…use it, don’t waste it. This life is a mystery…unfold it, solve it. It starts with meaning…wake up and understand it. Life is a goal…take it head on, and achieve it. Full of promise…fulfill it, but keep it. This life is a tragedy…face it, accept it. It starts with pain…wake up and help numb it. Life is a struggle…take it head on and fight it. Full of sorrow…sorry, just overcome it. It starts with hope…wake up and feel it. Life is a choice…take it head on, and make it. full of knowledge…use it, don’t abuse it. This life is adventurous…enjoy it, explore it. It starts with a duty…wake up and perform it. Life is love…take it full on, and love it. Full of beauty…praise it, and behold it. Life is good…be good with all that you know. Beautifully composed Suhas. Keep up the great work!